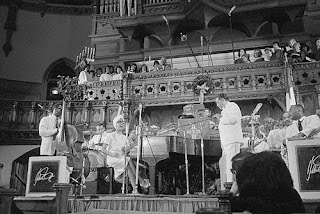 A couple weeks ago, I was fortunate enough to see the Aardvark Jazz Orchestra perform music from Duke Ellington's Sacred Concerts. I was also able to interview Mark Harvey for the JazzBoston newsletter. I was so taken with Ellington's Sacred music that I wanted to base my New Years resolutions off of some of the words Duke said of his companion Billy Strayhorn in the song, "It's Freedom." 1. Freedom from hate unconditionally. 2. Freedom from self pity. 3. Freedom from the fear of passively doing something that might benefit someone else more than it would him. 4. Freedom from the kind of pride that could make a man feel that he was better than his brother. The way Duke Ellington says these words hit me so strongly. Religious background aside, these are moral traits that we all strive for. What struck me about the song "It's Freedom" was the realization that freedom isn't just an external, socio-political ideal - it's within us morally. We strive to be a better person, and simultaneously being a better person makes us free. I would like to echo these freedoms for my New Year's Resolution. Making a new mantra for myself, I would like for us all to strive for self love, peace, acceptance and freedom by lessening hate, self pity, ego, jealousy and pride. Please subscribe to Kind of Pink and Purple by email (top right of the page) and follow on other social media: Twitter, Tumblr, Instagram, Google Plus, Pinterest. Also, please visit my jazz poetry blog, "Without a Poem." Good words to embrace on this new year.